We experience climate change primarily though water – intense rainfall, floods, droughts and so on. The major driver of economic growth in the twenty-first century will be responding to climate change, redeveloping our nations, revitalizing our cities and towns, and rehabilitating and expanding our ecosystems. This is not some wistful vision of the future: it’s already happening. 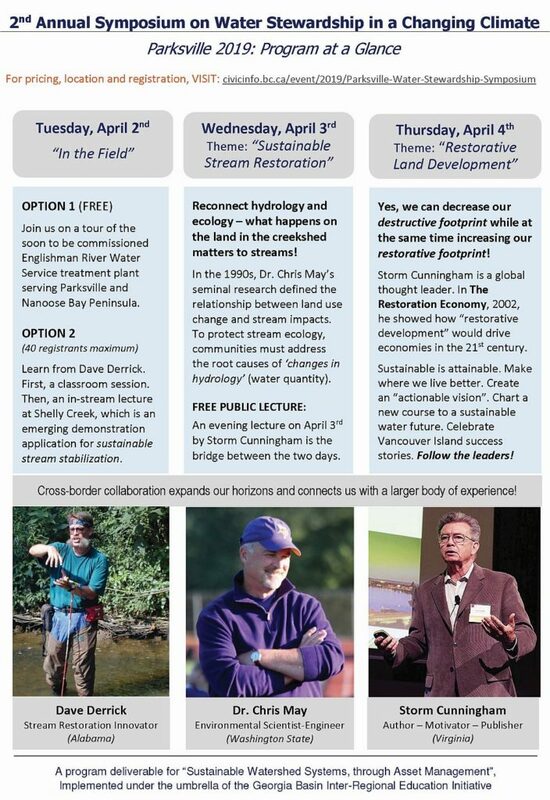 To learn more about restorative land development, attend the Parksville 2019 Symposium in April. Join delegates from the east coast of Vancouver Island and beyond, and attend a ‘watershed moment’ in the City of Parksville on April 2-3-4 for a field day followed by a 2-day symposium. The bridge between the two symposium days is a FREE PUBLIC LECTURE by Storm Cunningham, author of The Restoration Economy. Storm’s lecture is titled “Nature Is Regenerative: We should be too”. IMPROVE WHERE WE LIVE (“The Why”): The daily symposium themes are Sustainable Stream Restoration and Restorative Land Development. The spotlight is on why and how local government partnerships with stewardship groups can be transformational and ‘make where we live better’ to respond better to a changing climate. Vancouver Island success stories are beacons of hope! RECONNECT HYDOLOGY & ECOLOGY (“The What”): Connecting dots, a key message is that restorative land development results in sustainable stream restoration. Guided by a whole-system, water balance approach, restorative land development would reconnect hydrology and ecology, and this would: reduce stream erosion, flooding and the associated infrastructure liability; increase the dry weather baseflow in streams; and stem the loss of aquatic habitat and fish. SCIENCE-BASED UNDERSTANDING (“The How”): Dr. Chris May is the headline speaker on Day One of the Parksville 2019 Symposium, and will explain the science behind the Whole-System, Water Balance Approach. His leadership position in Washington State local government has allowed him to put science-based understanding into practice. Kitsap County is a living laboratory for implementing a hydrology-based approach at multiple scales (to build resilience). SCROLL DOWN. In the 1990s, the ‘salmon crisis’ was the driver for pioneer research by Chris May, Richard Horner, and others at the University of Washington (UW) to correlate the relationship between land use and stream health. Their work was seminal, transformative and far-reaching; shook the very foundations of conventional stormwater management practice; and opened the door for the Whole-System, Water Balance Approach to rainwater management and creekshed restoration. BC SITUATION (“The Now What”): The UW findings are integrated into Stormwater Planning: A Guidebook for British Columbia. The Partnership for Water Sustainability in BC continues to build on this foundational work. But opening minds to break with past practices and implement vital changes in practice is a continuing challenge. Opening minds requires patience, perseverance and ‘reachable-teachable moments’ to influence behaviour and thereby improve decision processes. Why is that? Entrenched beliefs, reluctance to change 20th century engineering practices, and institutional inertia mean that the process to adopt, change or evolve accepted practices is painfully slow. Hence, a desired outcome for the Parksville 2019 Symposium is that…. an informed stewardship sector would be the catalyst for accelerated local government action on Vancouver Island…. to implement restorative development practices guided by the Whole-System, Water Balance Approach. Hydrology is the engine that powers ecological services. Development hardens the land surface and reduces the capacity of the landscape to absorb water. Thus, there is more flow volume in creeks when it rains, and little or no flow during a drought. A foundation piece is to understand how ‘changes in hydrology’ have consequences for stream ecology. In 1996, researchers at the University of Washington, including Chris May and Richard Horner, published the results of their research into the root causes of urban stream degradation, and the consequences for aquatic productivity and fish survival. This was a ‘watershed moment’. Their findings demonstrated that stormwater (rainwater) management was as much or more about land-use decisions as engineering solutions. Their research also showed that communities needed to address a full suite of human stressors in order to improve watershed health. Changes in the urbanizing landscape, such as loss of forest cover and increased imperviousness, are the key to changes in watershed hydrology and stream ecology. “So many studies manipulate a single variable out of context with the whole and its many additional variables. We, on the other hand, investigated whole systems in place, tying together measures of the landscape, stream habitat, and aquatic life. We also built on a 1981 research project that was the first to realize that hydrology is the controlling factor,” states Dr. Richard Horner, now a professor emeritus at the University of Washington. He founded the Center for Urban Water Resources Management in 1990. More than two decades ago, Richard Horner and Chris May had a clear message for land use and drainage practitioners: changes in hydrology, not water quality, must be the primary focus of their efforts. If one gets the hydrology right, water quality typically follows takes care of itself in a residential development. “Unless and until land development practices mimic the natural water balance, communities cannot expect to restore the biological communities within streams. Simply put, hydrology hits first and hardest – one could pour an equivalent volume of distilled water into a stream, and the consequences for stream health would be the same as if it was urban runoff,” emphasizes Richard Horner. “The key to the Whole Systems approach is understanding how rainwater reaches a stream via three flow paths – surface runoff, lateral interflow in shallow soils, and deep groundwater. Unlock that key and we can successfully implement appropriate measures so that creek systems are more resilient and therefore able to better cope with an altered flow regime,” continues Chris May. “At Kitsap County we have applied this Whole Systems concept to develop our strategy for watershed retrofit and rehabilitation – it is not sufficient to do only a single (or even a few) things – it is necessary to do everything! We know we need to work at multiple scales and multiple levels to improve conditions in our small stream watersheds – that’s our strategy. “Retrofiting at multiple scales and multiple levels is really key. But, so many people in local government are just too busy these days to even contemplate what needs to be done to repair and restore at multiple scales and levels. As a result, and especially in the big urban cities, it is just too difficult for local government staff to work concurrently at multiple scales. “Now it is a matter of wait and see in order to be able to show the positive effects of the retrofit program. Everyone wants instant gratification, but realizing the benefits takes time. It took 100 years to get here. It will take many more years to turn the situation around. The initial signs are good. The monitoring shows that Kitsap County may be ‘holding the line’ in areas where development is occurring,” concludes Chris May.